All our shared hosting packages comprise a free-of-cost 1-click Web Apps Installer tool, which you can use to activate many popular PHP applications. It is extremely easy to use - you can set up your personal blog, forum, Content Management System-based site, online image gallery or e-commerce portal with just one single click and you don't need to have any technical competence. 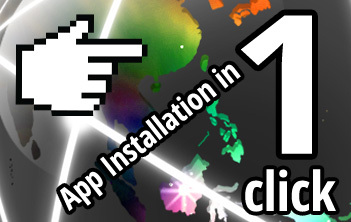 With the free-of-charge one-click web applications installer, you will save both time and money. The world's most popular blog publishing platform comes pre-installed and pre-configured with each website hosting package. An advanced tool for building online shopping portals, with more than two hundred and seventy five useful built-in features. Turn-key e-commerce portal. With a ton of templates at hand, you can quickly launch your e-store. A functionality-rich content management software system with a focus on aesthetics and convenience. A free-of-charge online learning platform, excellent for tutors. It enables everyone to create an e-learning portal. An advanced customer relationship management software platform, which can help you boost your sales and expand your market reach. The most popular app for building real estate websites, supported by a large and active community.